Posted in Government, News, Research, under Europe. The number of international students in German universities is higher than ever, with one in ten students hailing from overseas (11.3%), according to statistics published this week by the government-funded German Academic Exchange Service (DAAD). For the first time DAAD has also disclosed that around 50% of foreign students remain in the country after graduating. The survey gathered results from over 11,000 international students, and unlike results published in DAAD’s annual report published earlier this year, results were also taken from non DAAD grant-funded students, casting a more reflective representation of the sector. Interestingly over 30% of international graduates plan to stay permanently in Germany, while about 40% plan to stay for at least ten years and just 7% are planning a short-term stay. In fact 64% of students questioned have paid, full-time employment, 7% are working part-time, 7% are self-employed or freelance and only 6.8% are looking for a job. As well as job prospects, the main motivating factors for studying in Germany are quality of education (89%), the acceptance of German degrees internationally (72%) and 68% of students are motivated by low tuition fees. Other key findings from the survey reveal that Bangladesh has had the biggest increase in student numbers with a rise of 29% from 2013. Indian numbers also experienced a sharp upward trajectory, propelling the country to fourth place for the first time. While China is still the main country of origin, Eastern European numbers have also increased for the first time in six years. The results also found that the number of American students is increasing, while the USA is decreasing in popularity with German students. “A few years ago, four German students went to the USA for every American who came to Germany; now the numbers are almost equal”, said Sebastian Forhrbeck, former head of the DAAD-office in New York. “German higher education institutions have contributed a great deal to this positive trend by expanding summer schools, placement opportunities (such as the DAAD’s RISE programme) and exchange programmes with integrated components entailing going abroad,” said Forhrbeck. Of the over 11,000 international students surveyed, 31% hailed from Europe, 27% from Asia, 9% from Latin America, 8% from the Middle East and 4% from Sub-Saharan Africa and the USA respectively. @ThePIENews if highly qualified people want to stay on and increase national productivity we should be falling over ourselves for them. Tough competition for the nations like Canada and Australia as they promote immigration under various categories and education base is one of them. Tough competition for the countries like Canada and Australia as they promote immigration under various categories and education is one of the significant source to attract the immigrants. 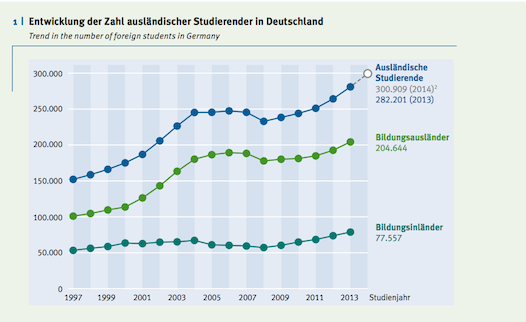 Doesn’t that now put Germany in third place in terms of total overseas student numbers, ahead of Australia? Very interesting. Would be interested to know how many people stayed back post 18 months.